We went to China in July. The weather was very hot & muggy throughout our stay. With Eleanor at University & Ian about to go, this was our first holiday for a long time without them. These were the days before we had digital cameras. I was not into photography then. Ann took all these photos with her trusty 35mm camera. All the photos on these pages have been scanned into our computer, hence the quality is not as good as with some of our other holidays. We started off in Beijing and then flew to Wuhan for the start of the Yangtze River cruise, ending up in Chongqing. From there we flew to Xian and then flew home via a very brief stop in Hong Kong. In addition there are some links to extra photos from most of these pages. 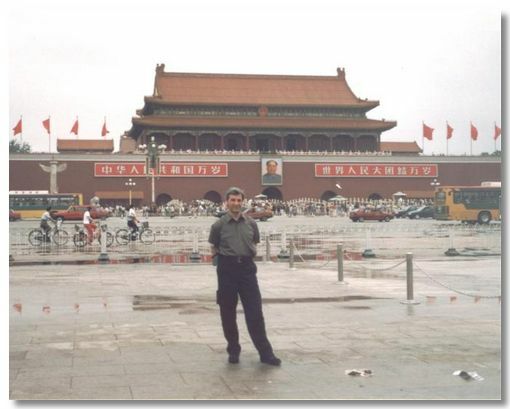 This is me in Tiananmen Square with the famous view towards the entrance gate to the Forbidden City adorned with Mao's picture. 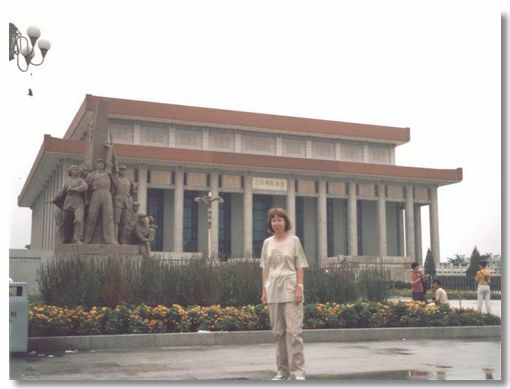 Ann in front of Mao's Tomb. Unfortunately we missed seeing the coffin, as it had been lowered back into the vaults. It is raised up from the vaults on a hydraulic lift every day, for a short time so that visitors can pay their respects. After a while walking round the square, we noticed vans strategically parked with policemen photographing everyone passing by through the windows. Being our first day there we thought better of trying to photograph them back! The Hutongs are the older parts of Beijing, with traditional small, single storey houses huddled round communal courtyards in winding alleyways. This is where I bought the Yangtze watercolour, hanging in our dining room. The week we were in Beijing was when it was announced that the city had won the 2008 Olympic games. Apparently the authorities will stop at nothing to ensure they are a success. A lot of the old parts of the city are going to be "redeveloped" to impress the 2008 foreign visitors. We saw a fabulous acrobatic show put on by the State Circus on our first night. 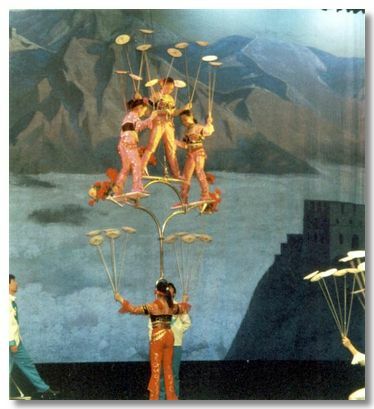 Any one of the acts would have been top billing in a circus back home. At the end, one of the cute child performers was giving out postcards, while standing next to a collection box. I got the idea tipping was a significant part of their income. The obligatory Tea Ceremony. 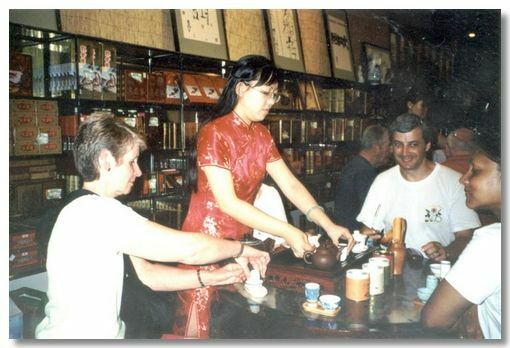 We were offered weak, but refreshing tea in just about every large shop or museum we visited. A nice custom. On our last night in Beijing, rather than eating in the hotel, a group of us found this Korean restaurant. 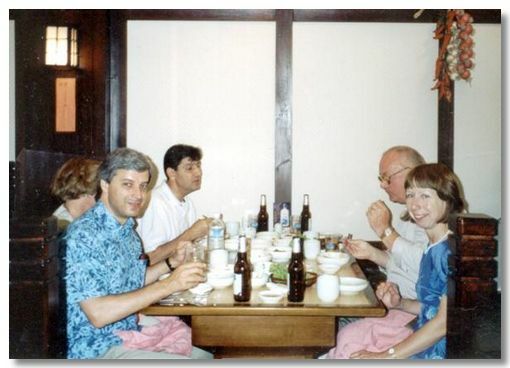 Even though they didn't speak English, we still managed a good meal. 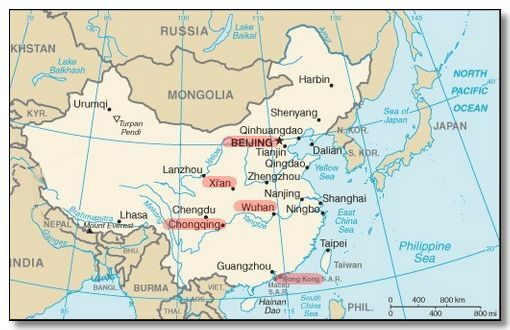 The deserts in China are Melon, Melon, or erm.... Melon. So Ann & Mirena went next door & brought back ice creams for us. We didn't know if the waitress complained or not, as we couldn't understand her! 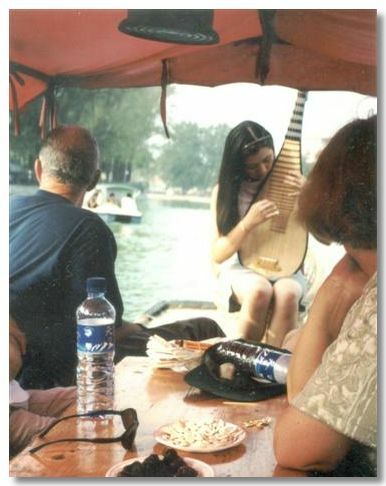 Being serenaded on Houhai Lake was very romantic, even if it was rather crowded with lots of other boats. The lake was previously the exclusive pleasure area of the Emperors. 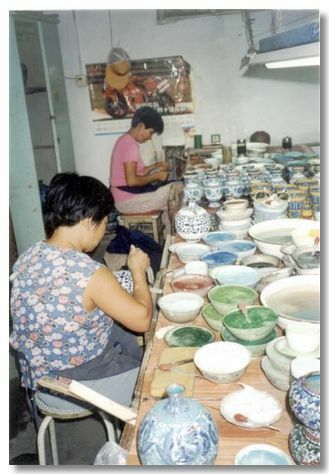 Our guides were keen to show us various workshops, such as this one producing highly decorative cloisonné work. In addition there are some links to extra photos from these pages.